How to build a bottle privacy screen | DIY projects for everyone! This DIY fence is one of the more creative ideas we’ve seen! If you need to make your outdoor area a little more private, then this repurposing project might just be the solution for you! 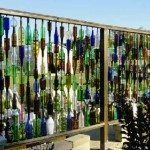 By repurposing and assembling empty bottles, you’re sure to have a unique privacy screen that can blend in well with your colourful yard. Just make sure to avoid or minimise the use of clear glass bottles. The more varied the colours, the better. You can definitely use bottles with a single colour, too!